This is a constantly changing workshop, as I discover more and more cool products out there and what to do with them. 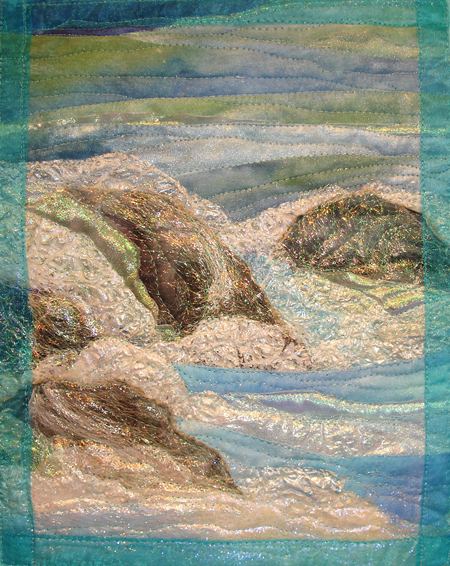 This is a process class where you're not expected to come out of class with a finished product, just experiment with various construction and embellishment techniques. 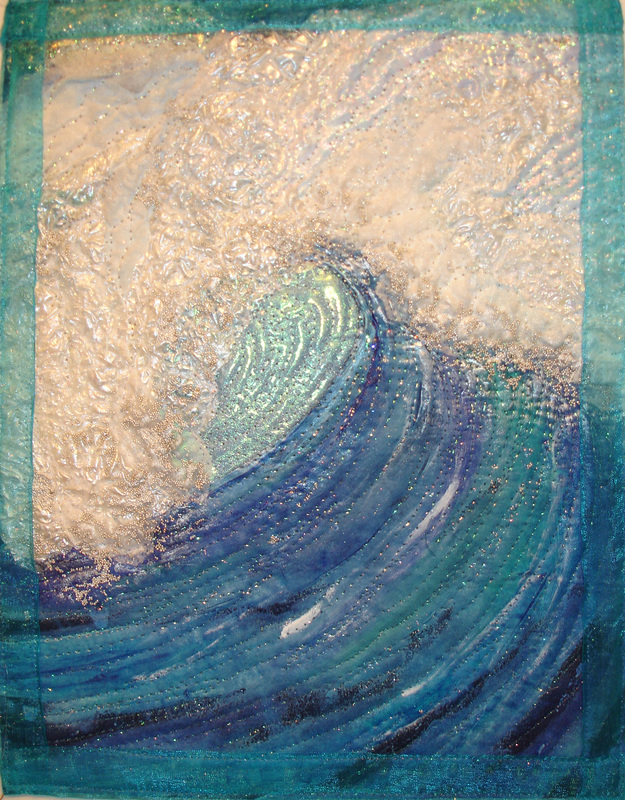 In this class we will experiment with substances that dissolve or melt, disappear or decompose before your very eyes, as well as some that puff up, shrink up, or fuse something to another something to create a whole new dimension. 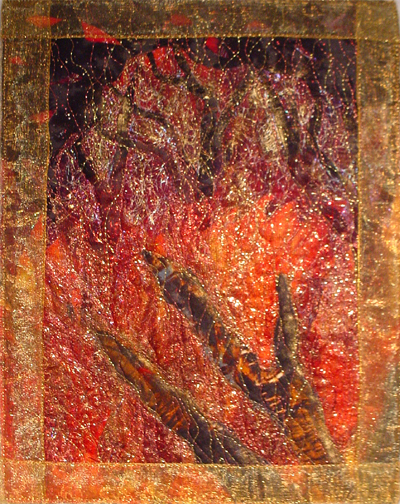 In this combination demonstration/hands-on class, you will find out how to work with Solvy, Bonding Agent 007, foil, Mistyfuse, Steam a Seam II Lite (or equivalent), Fiber Etch, Lutradur, Tyvek, Disappearing Paper, and whatever else I come up with by then. Materials fee: $20 for the esoteric things, but you still have to bring some stuff on your own! I won the 2003 Teacher of the Year award because, among other things, one of my students said I "put the knowledge in her hand." That is what this class is all about, to put these techniques in your hands. 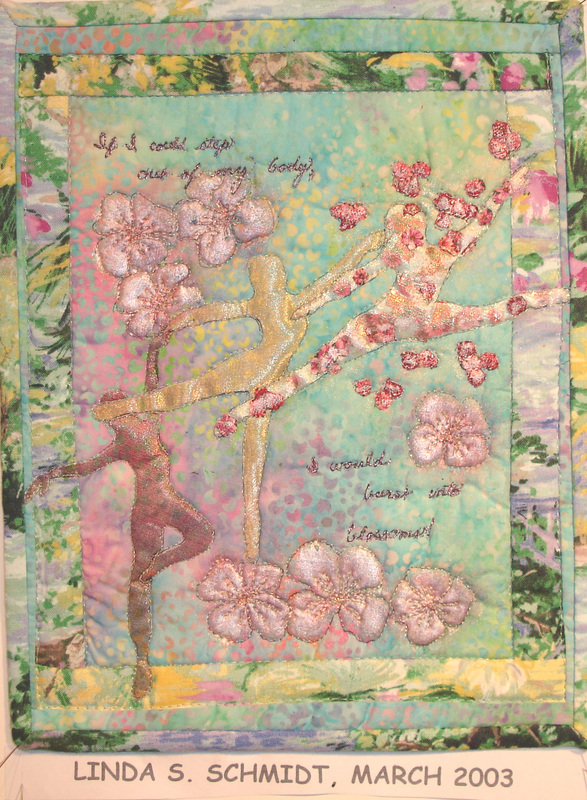 To commemorate that award, I made the little quilt at the left, which uses some of the techniques involved in this class, and then I made the little quilt in the top left line of quilts above, which says "If I could step out of my body, I would burst into blossoms." 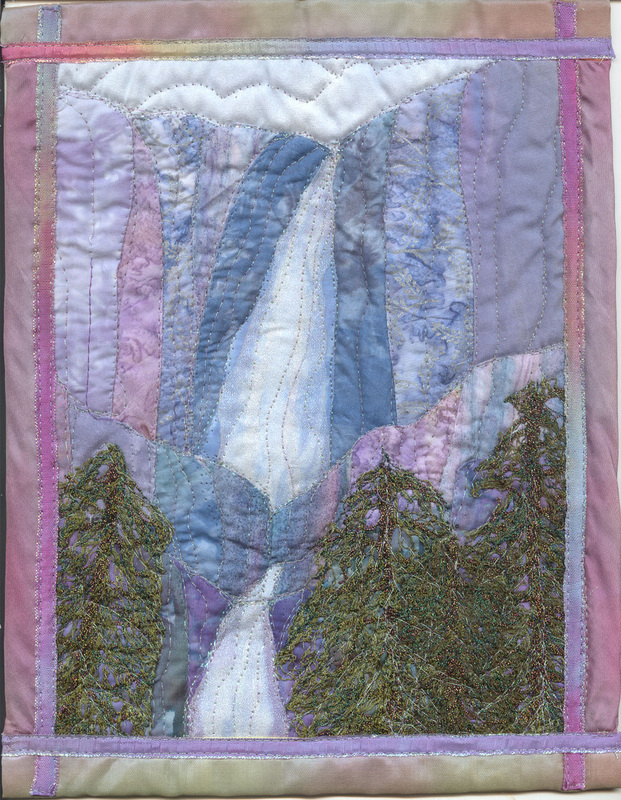 All of the little quilts above use some of the techniques we will be exploring in this class. How you use them, later, is completely up to you. Note to Workshop Chair: Students will need at least a half table, preferably a whole table and electricity. We will also need two extra tables for working with messy things like paints, so if you need to protect the tables and/or rugs, please provide plastic tarps. We will also need access to water, and about 5 irons/ironing surfaces for the class. Fabrics for creating layers. Bring one 12” x 14” piece of base fabric, and flimsy, sheer, sleazy fabrics that match it (preferably close to the same color) to create a fused base for stitchery. (For instance, white silk background, white opalescent organdie, silver lace, silver lame; white glitter tulle.) Be sure to bring some fine tulle that coordinates with it – just 1/8 yd or so, preferably the glittery kind. Small pieces of brightly colored fabric in greens or autumn colors to make leaves. We will cut these up, so just bring SCRAPS, but bring enough for a couple of small projects. Thread – whatever you have in metallic, sliver, rayon, fine braids and blending filaments. (YLI, Superior & Yenmet are my favorites) ! Spools of whatever fancy threads you have already – sliver, metallic, rayon, silk, blending filament, Kreinik fine braid, whatever. If you want to buy some really good metallic thread, buy Yenmet or YLI metallic thread or Superior holographic sliver thread (called Jewel). Bring brown or black thread to make tree trunk. Sewing machine, cord & extension cord. Be sure you have your darning foot, extra bobbins, and extra bobbin case (like black latch bobbin case for heavy threads).